Reiki is a simple hands-on energy technique used worldwide in hospitals, yoga classes, and private practices. 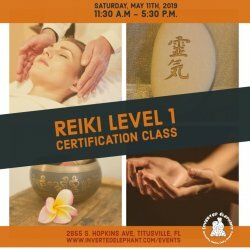 In this class, you will learn how the high frequencies of Usui/Holy Fire II Reiki work, the history of Reiki, body scanning, full treatment for yourself and others, and the Chakra system. Each student will receive an Attunement / Placement that will allow them to be conduits for this powerful Holy Fire energy. The Level 1 focus is on opening the energy channels on a physical level, allowing the practitioner to connect to the universal life force energy. You will learn to use self-Reiki and practice Reiki on a partner. Students often experience physical symptoms of energy after their first attunement like tingling, coolness or heat in their palms. Bring water and a pen or pencil. There will be a 30 minute late lunch break with vegan/vegetarian sandwiches included.